- Do you run an Early Music singing or playing group in this area that's looking for new members? - Are you an Early Music soloist looking for someone to accompany you? - Are you wanting to set up an Early Music singing or playing group with like-minded people in the Border Marches area? Whatever you're looking for, this page is for you. E-mail the Chairman with your request, and it will be posted here. Click here for an e-mail form. 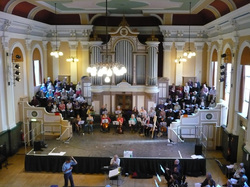 The Wales group of the Society of Recorder Players organises monthly playing days which visitors are welcome to attend. No need to book. Click here to visit their website and find out more (posted 22nd July 2017). (Holy Trinity & St Mary (Dore Abbey), Abbeydore, Herefordshire, HR2 0AA - Immediately east of B4347 road, at the village of Abbeydore. Grid reference: SO 387304). We perform a variety of choral music, much of it early, within the context of worship. We are looking particularly for Altos, Tenors and Basses with good to excellent sight-reading skills (although sound-files of parts are frequently available). Please contact Drew Morton on 07894 901755 or via his website. https://www.drewmortonmusic.co.uk/ ​(posted 9th May 2017). Are you looking for the chance to play or sing informally with a continuo accompanist, singly or perhaps in a small group? Or are you a keyboard continuo player who would like to practise with singers and/or instrumentalists? John Erskine, Chairman of the Worcestershire Organists' Association, has a fine range of keyboard instruments suitable for accompanying early and Baroque music – a virginals, a clavichord, a chamber organ and an organ console with Hauptwerk software (giving ‘virtual’ access to several famous early organs in Europe). He is generously offering the use of these at his home, and would be very pleased if those who are interested would contact him. He is particularly keen to try any cooperative ventures between members of BMEMF & WOA: some members of WOA could be interested in accompanying (at various levels, from beginner upwards) any members of BMEMF who don’t have their own continuo players. The New Titley Philharmonic Orchestra (aka the Titley Phil): We meet on a Monday afternoon at Titley Village Hall (between Presteigne and Kington) to play mostly 17th and 18th century music under the tutelage of David Hatcher. David, as most of your readers will know, is the talented player of many period instruments and an amusing and informative tutor/conductor. Occasionally, as a real treat, we get to accompany him in a gamba concerto but we also (any of us that feels that way inclined!) get the opportunity to play the concertante parts in concerti grossi and/or the solo in a concerto. Violinists and Viola players are always welcome, but at the moment we are looking - in particular - for a bassoonist and another oboist. Players need to have a minimum playing standard of Grade VI and to be confident sight-readers. We rarely perform. David works us very hard, giving us plenty of sectional tutoring in period style and technique, in the friendly and supportive company of the rest of the orchestra. Shropshire Harmony Quire is a small west gallery quire meeting monthly near Bishop’s Castle in South Shropshire. We sing and play music from Thomas Hardy’s time, mainly from the English West Gallery and American shape note traditions. Some of what we sing is rousing, some is unbelievable beautiful and it is all very melodic in structure. In much of the early West Gallery music the melody line is given to the tenor, with an underpinning bass harmony, contra-tenor and a treble voice or voices above. It has been said of West Gallery music that 'if we had hymns like that in our churches today they wouldn't be empty'. West gallery music was a vigorous, melodic style of worship at its height between 1700 and 1850. Thomas Hardy wrote much about the singers and players of the west gallery in his novel ‘Under the Greenwood Tree’. The vivacious and contrapuntal style of singing and playing was popular with parishioners who wanted to do more than sit in silence during services. Eventually, the singers and musicians of the west gallery were replaced by organists, Hymns Ancient and Modern replaced the old psalmody copies and much of the west gallery hymnody disappeared till the revival movement of the late 20th century. New instrumentalists and singers welcome (especially singers).